Pruitt has been a starter, in the minors. He’s about to be a reliever. A particular kind of reliever, a kind of reliever that might be becoming increasingly prevalent. I like Austin Pruitt a lot, and so, allow me to try to sell you on him. Where to begin! This spring, Pruitt has two walks and 18 strikeouts. There are 126 pitchers so far who have thrown at least 15 spring-training innings. By K-BB%, Pruitt ranks 11th, a little ahead of Clayton Kershaw and Corey Kluber. Now, Nate Karns is seventh. Sal Romano is fourth. Taijuan Walker is second. Spring-training innings are spring-training innings. But for Pruitt, this doesn’t represent anything new. This is exactly what he is, based — at least — on what he has been lately. The curveball — perfect. The last fastball — perfect. All four of the pitches are located well. Pruitt might’ve missed a little up a couple times, but the most important thing was that he pitched to either side, as he wanted to. As you can see, Pruitt doesn’t get by on finesse, but he’s definitely not a power pitcher, by today’s standards. For that reason, he’s never been so much as a Baseball America top-10 prospect within the Rays organization. Pruitt’s one of those guys who succeeds through location. They can be easy to miss, until you see the statistics. Pruitt’s career walk rate is just 4.8%. That’s low. And over the past three years, as Pruitt has graduated from High-A to Double-A to Triple-A, his strikeout rates have increased from 18% to 19% to 23%. As a full-time starter last season in the International League, Pruitt had 27 walks and 149 strikeouts. 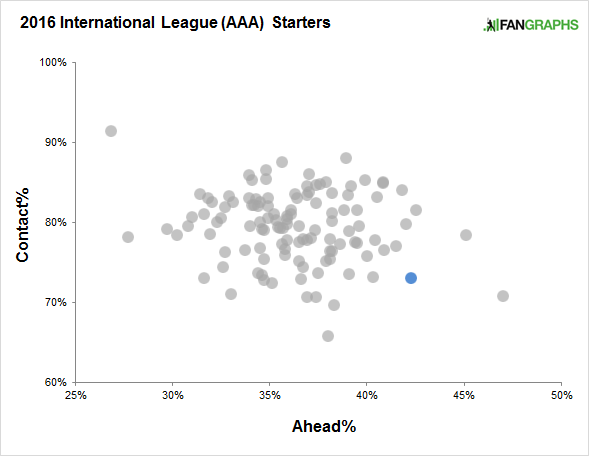 To look at things relatedly, but differently, here’s a plot of International League starters, showing contact rate and the rate of pitches thrown while ahead in the count. Pruitt is marked in blue. Pruitt’s isn’t the most extreme point in the bottom right — that one belongs to teammate Matt Andriese, who just managed a big-league 91 FIP-. Andriese also had a smaller Triple-A sample. Out of this sample, 70 pitchers threw at least 1,000 pitches, and Pruitt led that group in Ahead%. The most similar starter by these two numbers was hotshot Twins prospect Jose Berrios. The point isn’t that Pruitt is amazing. He’s not a guarantee to be successful. The point, rather, is that Pruitt has flown under the radar, in part because he doesn’t throw overwhelming stuff, and in part because he measures in at under six feet. His greatest skill is the one that takes the longest to see with your eyes, and since he’s turning 28 this August, he’s not even all that young. Pruitt would be an easy pitcher to miss, but it seems like he’s deserving of a job. The Rays are giving him one. And although it won’t be a job as a starter, Pruitt’s stuff could be better when he relieves. And the role he’ll have is increasingly interesting. Starts are getting shorter and shorter. That’s been happening for a while. You don’t see many complete games anymore, and there’s more and more talk about the times-through-the-order penalty. With fewer innings going to starters, that means more innings for relievers. Relief appearances have also been getting shorter! But. But, in 2014, there were 1,418 relief appearances lasting at least two innings. The next year, that number jumped by 102. The next year, that new number jumped by 135. We could be seeing a bounceback. Which only makes sense — if you don’t get so much length from starters, you’ll start to seek more length from the bullpen. You can’t have everyone’s assignments constantly getting shorter and shorter, because you’d need to shuffle through too many players. Teams are looking for multi-inning relievers. Relievers like Pruitt, or at least like how the Rays imagine Pruitt will be. If you’ve been paying close attention, the Rays already have one of these guys, in Erasmo Ramirez. Last year, he made 20 relief appearances spanning at least two innings, which tied him for the league lead, with Vance Worley and Christopher Devenski. Ramirez is staying in the bullpen, so the Rays here are effectively doubling up. They’re going to have two relievers they could feel comfortable putting out there for a while, and when I think about that arrangement, I think about what the Astros have in Devenski and Michael Feliz. Feliz last year made 12 relief appearances of 2+ innings. He and Devenski will again serve as vital depth behind a more suspect starting five. It’s not just the Rays, and it’s not just the Astros. The Reds have talked about having good multi-inning relievers. The Marlins have hinted at it. This is kind of the Mike Montgomery thing, or the Juan Nicasio thing. Long relievers have existed for decades, but, typically, they were nothing but mop-up men. Guys who could save the good pitchers. Now they *are* good pitchers, more often, pitching more important innings. It’s a natural consequence of keeping starters on an ever-shortening leash, and this is one trend I’d expect to continue. Teams will seek out these multi-inning types. They’ll develop these multi-inning types. And they’ll sometimes have to lean on these multi-inning types. I’m a big fan of what the Astros have in Devenski and Feliz. I don’t think the Rays can match up to that yet. But they’re going to try, and Pruitt is likely to help. He’s a talented pitcher, and although he’s shifting from the rotation, I wouldn’t say that he’s being demoted. We hoped you liked reading My Favorite Reliever of the Month by Jeff Sullivan! Good read, I’d also add Chase Whitley, eventually Andriese, Hunter Wood and who knows who else. The Rays realized that Erasmo Ramirez types are great, but you can’t get by with just one. Having two or a pipeline is the way to make it work. It costs you specialists, but who really needs those anyway?